There are moments that have no words and only sensations can define; emotions that know how to reach straight to the heart and that become ecstasy, joy and beauty of a moment to be enclosed in the most intimate of memories. We try to express all this through our wines, through the experience of hospitality that we reserve for those who come to visit us to satisfy any curiosity or simply to enjoy a good glass of wine breathing the reality of the cellar, open to guided tours with tastings , from Monday to Saturday morning and weekend on request. The reception is made personally by the Goretti family inside the rooms of the historic family tower. It provides for the tasting of the main Goretti labels, to experience the many nuances of taste obtained from our wines. Complete tasting of our best wines served in crystal glasses appropriate to each wine skillfully matched to our local specialties, to live a delightful and memorable experience. Let yourself be guided in an intoxicating journey to discover our finest wines selected for you. Grechetto: DOC Colli Perugini accompanied with Bruschette prepared with homemade bread Umbrian and extra virgin olive oil DOP of our production. Il Moggio: (100% grechetto vinified in barrique) with a selection of aged cheeses accompanied by millefiori honey of our production. L’Arringatore: DOC Colli Perugini, red, paired with homemade flavored cake stuffed with local salami. 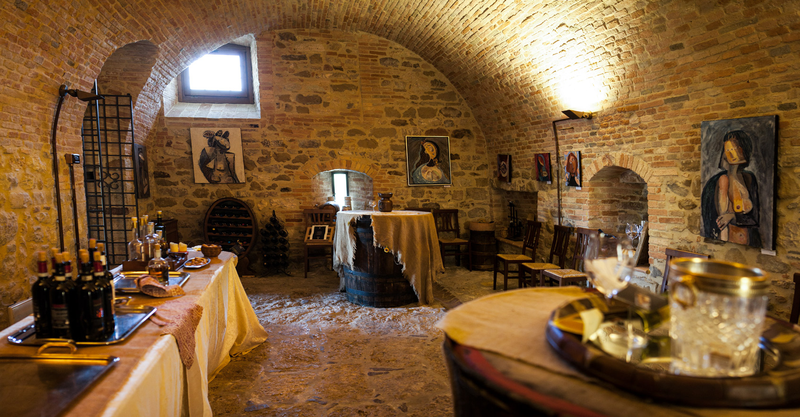 Sagrantino di Montefalco Fattoria Le Mura Saracene: With cheese pie and local cold cuts. Il Santo: Sweet liqueur wine with Umbrian tozzetti almonds made by Nonna Marcella. Selection of Grappa and Brandy aged 20 years: Grappa di Grechetto, Grappa di Sagrantino and Grappa de L’Arringatore with local chocolate sweets.